Note: This is an English translation of the German version, which can be found on the DARC homepage. 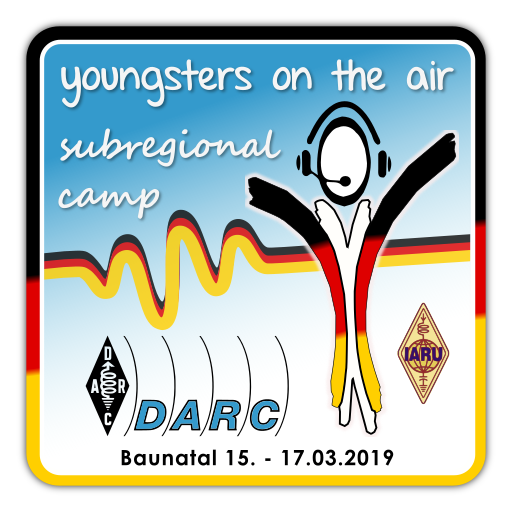 The Youngsters On The Air project is an initiative by the IARU aimed at bringing young radio amateurs together and support their activities and projects. What is this subregional camp? The subregional camp is a gathering point for young hams that want to meet likeminded people. Be it operating, contesting, antenna building, soldering, or programming, there will be something for everyone. Since the camp happens in March, all participants will be accommodated in two-bed rooms in the Hotel Stadt Baunatal, about 2km from the DARC amateur radio center. Nobody wants to be put into a room with a stranger, however there unfortunately is no way around it here. We will definitely arrange the room assignment together with the participants though. Since the IARU and the DARC financially support the event, accommodation and catering will be free of charge. Getting to the camp is the responsibility of the participants, and drinks will be provided at cost price. Bus No. 51 leaves every 30 minutes from Kassel-Wilhelmshöhe train station directly to the hotel (stop Altenritte-Hotel). The ticket costs 3.90€. There will also be a “Who else is coming” list, on which people can offer or look for a lift. If you do not need a hotel room, please check that option when registering. We will gladly give the opened spot to another participant. What will we do at the camp? How is the CQ DL (DARC’s monthly magazine) made? There will also be some workshops organised by the participants themselves. Don’t worry, we do not want to solder the 100th blinking light or bore you with presentations about topics you don’t care about. We want you to be able to do the things at the camp that you care about. And that together with the others, which is why the workshops will be held by the participants. It will be up to you to choose whether you want to organise a workshop yourself, or instead have a free choice of what to poke your nose into. If you have a topic that you know a bit about and which you want to show other people at the camp, please say so when registering so we can prepare everything you need. Further ideas could be: Operating on Es’Hail 2, HamNet, programming, FT-8, etc. In short: Sofas, soldering irons, and a lot of space for your own ideas. Because this event is about getting to know people with the same interests. The camp is aimed at DARC youngsters aged 14 to 26 that do not have any contacts other than their local club. If your first thought about “visiting a youth field day” is “but I don’t know anybody there”, then the subregional camp will be the right place to be, since there you will get to know people in the exact same position. We are also looking for people from other countries, since our hobby does not stop at country borders. However, you still need to take care of getting there. You should also know some German, since this will be main (and probably only) language at the camp. Since we only have 50 spots, we might not be able to let anyone come. If you already know a lot of people there, or participated in several previous, similar events, you might only get a spot if you also hold a workshop. We also cannot accept registrations from big, pre-existing groups of youngsters. In this case, please select 1-3 people to represent your group. … I’m not a member of DARC/ÖVSV/etc. Since the camp is supported by the IARU, we can only accept members of a IARU member society (DARC, ÖVSV, SSA, VERON, UBA, …). The camp will be held by experienced organisers of other youth events. As long as your parents are OK with it, you can participate. Please note that we take the Jugendschutzgesetz (German Youth Protection Law) seriously, so we will not tolerate if you only come there to get drunk. For assigning the rooms, you will of course get a room together with another YL. Should it not be obvious from your first name, please note it down in the “First name” field in the registration form. If you select the option when registering, we will take it into account. We take the Jugendschutzgesetz (see above) seriously and also will not offer any alcohol. Of course, we cannot forbid people aged 16 and older (18 for hard liquor) to drink alcohol in their free time (for example in the hotel room with some others). However, we still have a simple rule: If you throw up, you go home. If anything is unclear, just write an email to ham-yota@darc.de. You can find the registration form at the end of this page on the DARC site. Should you need help, just contact the organisers. Keep in mind that we only have 50 spots and thus might have to pick who can come. We will not do First-Come-First-Serve. You will get an automatic email after registering. After we selected the participants, you will get another email, whether you were selected or not. The decision is final. Deadline is Sunday, 3rd February 2019 at midnight CET (23:00 UTC).